I wondered how good they could really be, without flour, and only 5 ingredients. I showed them to Jake and he said, “If these are good, I’m making them every weekend for girls, they’ll think I’m a genius“. So we whipped up a batch. The skeptic in me thought -these will probably be awful. Guess what? Pleasantly surprised. I followed the directions exactly, and in less than 1/2 hour we were sampling some pretty tasty cookies. I’m thinking my friends (who will remain nameless) that have cooking/baking challenges will be able to throw these together in a flash, and succeed in the kitchen! Great for peeps with gluten issues too. And college students. How about those living abroad who have trouble buying ingredients for treats? Everything except the egg can be packaged and sent. Super simple, pantry-ready, yummy homemade cookies in just a few minutes. Yum. Mix all ingredients except chocolate chips. When blended, mix in the chocolate chips. Using a small scoop, form 1 1/2 inch balls (dough will be very wet and sticky) and place onto an un-greased parchment or Silpat (silicone) lined cookie sheet*. Don’t make them too big because they spread. Bake for 9 minutes. Let the cookies cool completely before removing. -I also baked one pan without a liner of any type, ungreased on the cookie sheet, they did not stick and turned out just like the other pans. -I did not pat the scoops of dough down at all before baking. You know I don't like it when you make cookies I would love and then don't bring me any. They were so good we couldn't even get any on a plate and down to your house!!! They are perfect and delicious with a cup of tea! I thought of her when I made these! In disbelief I sent brett to the store to get peanut butter so we could make these- They were awesome and delicious! I can't decide if it's a good thing or a bad thing that they were so easy. Same with a 2 minute chocolate cake in a cup recipe we tried the other day. Haha! Love how often you're posting! Lis, it's a GOOD THING! Oh my! I have been reading your blog and loving it for a few years. I'm good friends with Kimi and she let me know about it. Anywho, I had to change 3 of the 5 ingredients to make these for my allergy ridden husband. But worth it! They are the only baked goodie he can have. Thank you! For 35 plus years I have been using essentially this recipe. No baking soda or choco chips. Even my kiddos as young as 4 could make this by their self. of course me putting them in the oven. This is a favorite of ours. How do I adjust this for low altitude? 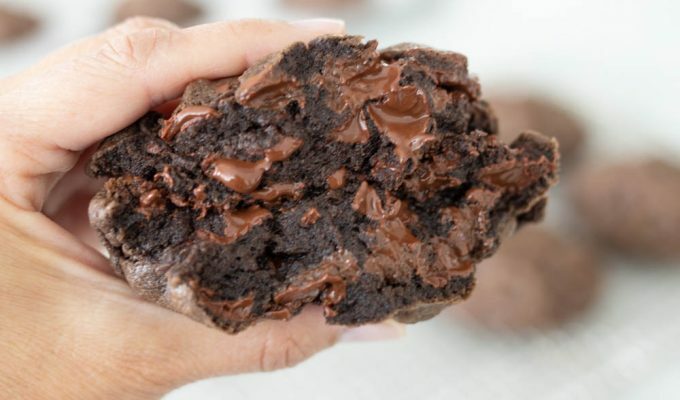 I just made these and my dough was crumbly when everything was mixed together – not wet and sticky. Hi Jen, I did not adjust these for our hight altitude in Utah. I made the recipe exactly as it was written. If the dough is crumbly, add about a tablespoon of milk at a time until the dough binds together. Also, I used a fairly creamy peanut butter, Skippy or Jiff work well. Just made these…I'm loving how they taste and how easy they were to whip up!